Not having ever been religious myself I am very skeptical of these claims. Please read the article for more details on the claim. Besides me thinking that it's an incorrect claim, I also don't think that it is actually possible to produce a reliable scientific study on religious belief and genetics—so the studies must be misquoted somehow or not scientifically based. Does this piece of news correspond to the findings of the studies? Are the studies scientific or are they philosophical essays? ...and to any interviews given by the two academics from Oxford University that led the studies. First mentioned in Towards a Cognitive Science of Religion by E. Thomas Lawson, 2000.
International Association for the Cognitive Science of Religion (IACSR) founded in 2006. Studies by Emily Reed Burdett and Justin Barrett...press release text. The cognitive science of religion. Barrett, Burdett. Deborah Kelemen from Boston University finds...press release text. Are Children ‘Intuitive Theists’? Kelemen, 2003. Experiments involving adults...press release text. The cognitive psychology of belief in the supernatural. Bering, 2006. Reasoning about dead agents reveals possible adaptive trends. Bering, et al. 2005. The development of ‘afterlife’ beliefs in secularly and religiously schooled children. Bering, et al. 2005. The studies (both analytical and empirical) conclude that humans are predisposed to believe in gods and an afterlife, and that both theology and atheism are reasoned responses to what is a basic impulse of the human mind. - Project Director Justin Barrett, Ph.D. The science does not support the conclusion. These intriguing findings would certainly be strengthened by replications with additional stimuli sets, alternative methods, and with different cultural populations. As they stand, they suggest one possible cognitive reason for the culturally widespread existence of religious beliefs in deities that either order or create the natural world: such ideas resonate with an early developing and persistent intuition that the natural world looks purposefully designed. Refusing to accept that, in principle, science could ever allow space for non-material, even theistic, explanations demands philosophical argument, not an assertion of the supremacy of science. The obscurantist refusal to allow the theory of Intelligent Design to be even discussed in a scientific context can only be the product of a deeply-ingrained materialism, even atheism. - The Religious Roots of Science, Roger Trigg. The burden of proof lies with the claimant. The claim stands or falls on the quality of the evidence the proponent can provide. To be taken seriously, claims must be testable, at least in principle. The evidence must be public and accessible to all competent critics. Science is a public activity based on trust. Journal of Cognition and Culture, ED: E. Lawson and Pascal Boyer. Book editor: Justin L. Barrett. EDIT TO ADD: dancek (who gets a +1 from me) found the actual study and the relevant information on the study. Given the list of authors, this seems to be a theology/philosophy study rather than hard science. Furthermore, since this appears to have the hallmarks of a meta study, I must add in my thoughts on that. The correlation factor (oft called Gamma) is pulled out of the air and pretty much reflects the bias of the people funding the 'study'. They often rely on something called a Gaussian copula. Here's an article about a famous, Nobel Prize winning one. http://www.wired.com/techbiz/it/magazine/17-03/wp_quant different use, but similar method. Basically the heart of the Wired article says that people will see what they want to see. A sort of confirmation bias. (Original text follows) Sadly it's very difficult to answer your question directly since the Telegraph article does not link to the studies themselves. Furthermore, it seems to be (at least the title question) a very philosophical question. At this point in time, the only thing we can say for sure is that we don't know if humans are predisposed to believe in anything. Although I am familiar with some of the discussions based on personal research and discussions, so let's see if we can possibly get at the root of this. In looking at the claims of the article, I would guess that this is a meta study that would include elements of both. Without a link to the actual papers and studies though, we are left very short on an actual answer. Every single search on the internet led back to an article similar to the one in the Telegraph with no additional citations. I would personally posit that evolutionarily, we are predisposed to listen to authority figures. An evolutionary benefit is that we would behave as a cohesive unit, and if this authority figure is older, or possesses some unique trait that allowed him/her to survive, that information would be a benefit. There are numerous studies showing how humans gravitate to authoritarian behaviour, such as the Milgram studies, or the Stanford prison experiments. Religion has managed to hijack this particular evolutionary trait in such a way as to become pervasive throughout human society. And if there is no specific religion, then another authority figure steps in to fill the void (such as a cult of personality or a political idea). Theories on the evolution of religion tend toward two camps. One argues that religion is a mental artefact, co-opted from brain functions that evolved for other tasks. Another contends that religion benefited our ancestors. Rather than being a by-product of other brain functions, it is an adaptation in its own right. In this explanation, natural selection slowly purged human populations of the non-religious. Another site seems to be dedicated to ferreting out how religion evolved in humans. I haven't perused this site much, but http://evolution-of-religion.com/aims/ may give some data. Be aware that this site is funded by the Templeton Foundation, but their aims seem to be interesting at least. This page gives an EXTENSIVE list of publications on the subject. I am not that familiar with all the authors, but I have a new reading list I think. There is also the idea that human brains are naturally tending towards purpose driven explanations for things as opposed to understanding the full spectrum of how the world around us really works. This is a hallmark of a young and immature mind, yet many adults exhibit this behaviour as well. called promiscuous teleology - in young children. Seven and eight-year olds agree with teleological statements such as "Rocks are jagged so animals can scratch themselves" and "Birds exist to make nice music". These mistakes diminish as kids take more science classes and learn causal explanations for natural events. A first round of experiments suggested that adults make more teleological mistakes when pressed for time than when not. 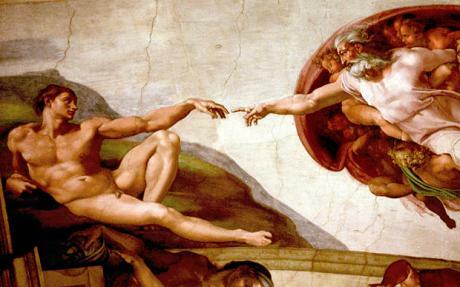 Finally, Talk Origins has a page dedicated to the evolution of religion. (1) Lifted from the Wikipedia description of his show. The referred research project is called Cognition, Religion and Theology, and summaries of the topics covered are available (containing citations to actual publications, including empirical research). The overarching goal of the project is to support scientific research that promises to yield new evidence regarding how the structures of human minds inform and constrain religious expression. The project will conduct research on the cognitive underpinnings of religious concepts and practices – for example, ideas about gods and spirits, the afterlife, spirit possession, prayer, ritual, religious expertise, and connections between religious thought and morality and pro-social behaviour. Research is not limited to any particular religious belief or tradition. Indeed, much scholarship in this area is concerned to explain broad patterns of recurrence and variation in religious concepts and practices across diverse cultural and ecological contexts, and throughout history and pre-history. The project forms part of a broader field of interdisciplinary scholarship on the cognitive foundations of cultural expression more generally. The research team consists of experimental psychologist Dr Justin Barrett (Primary Investigator, Centre for Anthropology and Mind), philosopher Prof Roger Trigg (Co-Investigator, Ian Ramsey Centre), and Dr Miguel Farais (Theology). Ms Ann Cowie is Programme Administrator. It seems to me like the research would lean towards philosophy and theology. However, the project has included a huge amount of research on different topics by different teams, and I can't currently be bothered to really look deep into their research. EDIT: A couple of quite good articles from New Scientist say that humans find purpose even where there's none and that children naturally believe in supernatural things. These articles are be based on empirical research (though of course New Scientist is no peer-reviewed journal). I guess one could simplify and combine a prioris like these, and come up with the claim "human thought processes are rooted to religious concepts". Not the answer you're looking for? Browse other questions tagged psychology religion anthropology . Are shopping centres busier when it rains? Are dogs loyal to their owners?